Are your friends deciding who has to take out the trash at the end of their house party? Inspire them to Rock, Paper, Scissors for it! Is your crew deciding who will call the rideshare? Rock, Paper, Scissors, you tell them! It's a simple game, and an ancient one. It’s the game everyone claims to be “amazing” at. What’s your strategy? Do you always throw rock? Do you tend to lay down paper until it “feels right” to switch to scissors? Don’t give away your secrets! Instead, you three should Rock, Paper, Scissors your way through the night and inspire others to do the same. 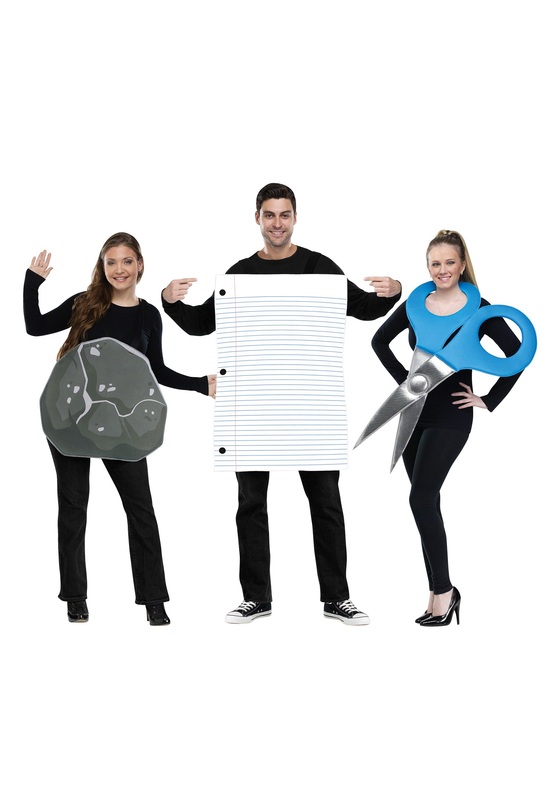 Hey, maybe you picked this costume via a game of Rock, Paper, Scissors...that’s great! We applaud you. The costume is very creative and works well with the team of three. The main issue that I had with the paper and the rock is that the straps were very loose and no way to tighten that on the person so the costume kept falling down or the strap kept falling off. Making a more durable strap would be very beneficial.